Thomas Crapper: A Man, A Plan, A Commode! Selected "Site of the Day" by Seven Wonders. Inventor of the Flush Toilet? Some people claim that Thomas Crapper, a London resident in the late 1800's, invented the modern flush toilet. Others disagree. All agree that he existed and was involved in the plumbing business. Whatever the truth, the Science Museum in London has a display of cut-away working models of flush toilets. One of them even includes a suspicious-looking brown object that you can flush away...an automatic mechanism soon returns it to the bowl to await another flush. 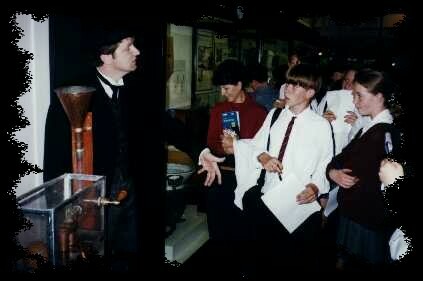 Photo of "Thomas Crapper" demonstrating his flush toilet to Science Museum visitors. 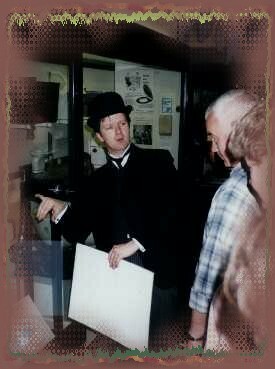 Mr. Crapper visits the museum from time to time to explain the workings of this household appliance to crowds of bemused visitors. Mr. Crapper with working cutaway model of flush toilet. Flushable brown object is not visible in this photo. 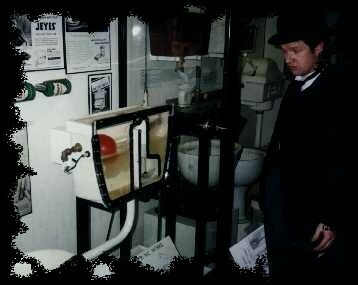 Mr. Crapper using his humorous style to teach school children about the toilet. He says he doesn't mind having people call his invention by his name, but he doesn't like the fact that many people also use his name to describe what goes into the toilet. 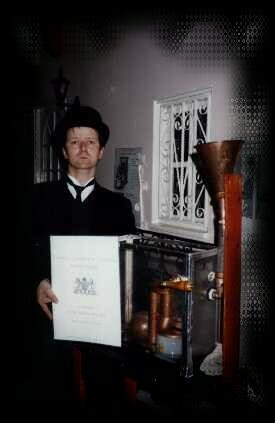 Mr Crapper with certificate and working model of flush valve. Bucket of water, used to demonstrate the flush valve action, is located underneath toilet. 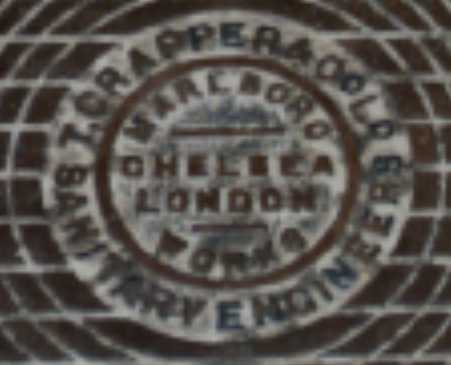 Photo of manhole cover manufactured by T. Crapper. 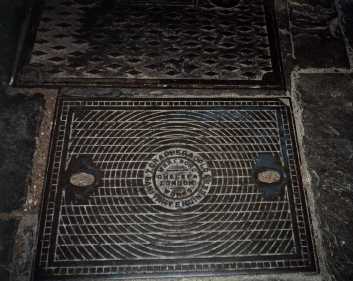 Two of these manhole covers are still in use in Westminster Abbey. To find them, enter the Abbey, continue past the coffee bar and take a right turn to exit the building. The two manholes are located inside the building, within about 10 meters of the building exit. A visitor writes: There is, or was, at least a third manhole cover that is/was in the alley behind the Woolworth's in the Kensington High Street. Get off the tube at Kensington High St. and across the street is/was the Woolworth's. The cover, which we have to rubbings of, is in the alley. Watch out for traffic though...look right, not left as in the USA, when you step off the curb. And do "mind the gap." A stained glass window has been installed in St. Lawrence's church near Doncaster, England, to honor Thomas Crapper, the inventor of the flush toilet, who was born in nearby Thorne. They drew the line at depicting a toilet in the traditional white, however. Here is a link to the history of Thomas Crapper, at the web site of the modern-day Thomas Crapper company.